Artistic Director Robert Negron has been back at Sa-K-La-K-Wel for exactly one month. Much has happened since the unfortunate police raid and temporary closure of the school. Here is Robert’s first update since being back on the ground. “Reaching one month back at SLW and day to day activities are fully restored. After landing in Port-Au-Prince my first stop was the US Embassy. It was surprisingly painless to get in and fill out what paperwork was needed. They were unable to make any real comment on the situation, but they gave me a list of Haitian lawyers to consult on the matter. The landlord came out from the city to talk things through the moment I arrived. I had never actually spoken to Millete,the landlord, but I left the conversation assured that we were dealing with a good man. Millete said he was handling the break in and that we never had to worry about anyone harassing us again. A court case is moving forward and even the local radio station had a segment on what happened. Everyone seems to have galvanized around Sa-K-La-K-Wel in a way that I did not experience on my last visit, and my arrival appears to have signaled everyone that Sa-K-La-K-Wel is here to stay. 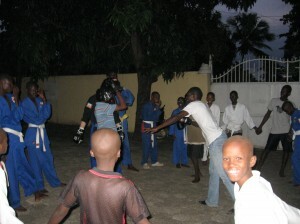 An evening sparring class at Sa-K-La-K-Wel. Unfortunately our Landlord now wants the “full price” for the cost of rent next year (which is more than double what we were expecting to pay). It was a shock for everyone to find ourselves so quickly back in a situation that could close Sa-K-La-K-Wel. Negotiations have finally finished and we have the Locale for one more year. Our programs director Desire Chantal will return to the States and raise the extra money needed. It leaves us without a teacher for the English class, but at least the doors stay open. Robert: John, your land is too small and there are already too many people living there. Robert: Wait, that’s your land or your family’s land? John: Some for my family and some is just mine. I will go to show you, and if you like, we will build SAKLAKWEL there. Robert: I like John, I like very much! There is much work to be done, but with the blessing of his family, John and I will begin the task of clearing the land this December. With any luck we will be ready to transition up the hill to our new (rent free!) home in 2014. For now we will keep programing and classes running at our current Locale. Electricity will hopefully be back by next week and we will be able to start the Cinema again. The last Friday of every month will be Haitian Cinema weekend where Haitian film makers in Jacmel can screen their most recent projects. We hope to grow our programs even further this year while engaging the community in our new venture. 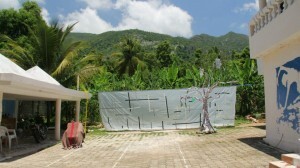 With a little luck by next year we will have a community center owned, built and run by the community it serves. Stay safe and keep up the good work, Robert! We miss you.